SMART Group of Companies (Myanmar) has showed its power by participation in many social responsibilities activities and also it is following of our own values 4P’s (People, Planet, Principle and Partner) without fail. 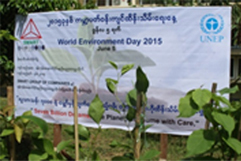 SMART has already decided to plant trees around Yangon in every rainy season especially in World Environmental Day. To attain these goals, Planting Trees Program was celebrating annually by our enthusiastic employees. 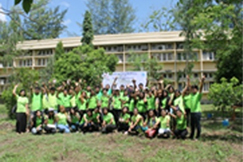 So this year, on World Environmental Day, June 5th 2015 (Friday), we went to Hlaing Thar Yar Technologies University located in Hlaing Thar Yar Township to accomplish our mission. In this program, not only SMART employees but also university students corporate together and plant trees untidily. Together with this event, all employees and students shared environmental knowledge to each other and this sharing knowledge will also affect their attitude to their daily routine working activities of environment and finally to benefit the earth.